This system is ideal for simple paging requirements such as push-for-service service counter buttons or calling managers to the front of the house when things get busy. The set includes an LRS Butler II five-button push-for-service transmitter and one alphanumeric text display pagers and a program kit. Works with optional door sensors and door bell switches to send text messages when doors are opened or buttons pressed. Click links below to see more products in the class. Options and their Prices? Click an Add to Cart button (above, left or right). More Details? Keep scrolling -- this listing may be very long. Related Products? Look in the left margin. Purchase Now? Click an Add to Cart button (above, left or right). This item is a simple paging system with one LRS Butler II five-button transmitter and one alphanumeric text display pager with optional door sensor or door bell switches to send text messages when doors or windows are opened or door bells pressed. Place Butler II push-for-service pager transmitters everywhere you wish so anyone may contact your staff with five buttons for different messages for each button. The LRS Butler II five-button pager transmitter has features which make it especially suitable for simple paging requirements such as push-for-service service counter buttons or exam room attention calls. Butler II transmitters are good for general-purpose push-for-service paging and are widely used in small healthcare clinics and are especially popular for use in eye care offices. Inexpensive, small and battery-powered, the Butler II Five-Button has five buttons and one input port for door sensors or door bell switches that are PC-programmable that send your text messages. 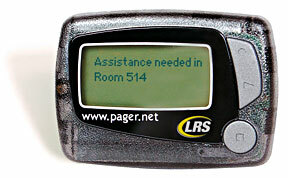 Works with all LRS pager types. Programmable alert styles for non-text pagers. The Butler II five-button has five buttons which can be programmed to transmit custom messages or alert styles. The buttons are programmed using software that runs on your PC and then the program is downloaded from the PC to the Butler II transmitter using a USB cable. Send any alert style to non-text pagers. You can use five programmable buttons and one input port to send six different messages to one or more pagers or send different messages to six pagers as well as many other combinations of messages and pagers. Let's say you need twenty-five buttons instead of five -- then simply get a bank of five 5-Button Butler IIs and mount them side-by-side or any way as needed. Butler IIs can work separately or together. For example, with five Butler IIs you can send one text message to thirty different pagers or thirty different messages to one pager (with all kinds of setup variations in between). Compact - 1.5"w x 7"h x .875"
Extendable range - works with the LRS repeater transmitter to greatly increase range. No monthly fees or dependence on area services. Beeper-style pager with belt clip. Uses one AAA Battery that lasts three to four months. You can call us at 805-375-7000 to place your order or you can order your system components using the shopping cart here at FoodSoftware.com. One Five-Button Butler II transmitter. One programming kit with USB cable and software. Additional Butler II or other LRS transmitters. To add any of the above to the shopping cart, use the links under Related Products below. Delivery Time: Normal delivery with UPS Ground takes three to seven business days, depending on your location. Rush Orders: If your order is urgent and you want assurance of immediate shipping, you must call us at 805-375-7000. Note that UPS only guarantees delivery dates for its overnight services. Overnight Shipping: Overnight shipping is available for this item to most US locations. Friday overnight shipments are normally delivered on Monday unless Saturday delivery is requested by phone. Saturday Delivery, where available, is 50% more than regular overnight. Returns: LRS Products are returnable within 14 days of delivery. Refunds are less shipping, 15% restock fee and charge card merchant fees (if applied). US Delivery Only: Radio equipment regulations apply to pager systems and are such that we can only deliver LRS products to US addresses.